Django Media Tree is a Django app for managing your website’s media files in a folder tree, and using them in your own applications. Enables you to organize all of your site media in nested folders. Supports various media types (images, audio, video, archives etc). Extension system, enabling you to easily add special processing for different media types and extend the admin interface. Speedy AJAX-enhanced admin interface with drag & drop and dynamic resizing. Upload queue with progress indicators (using Fine Uploader). Add metadata to all media to improve accessibility of your web sites. 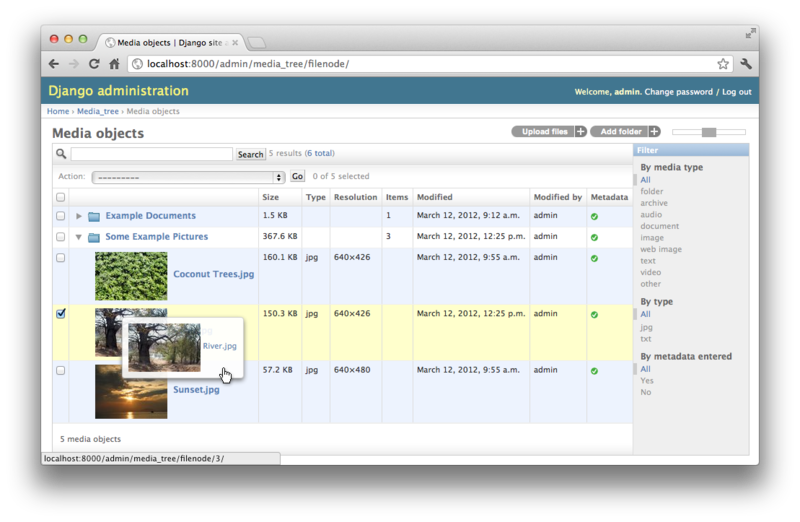 Integration with Django CMS. Plugins include: image, slideshow, gallery, download list – create your own! Your choices range from implementing file listing and detail views based on the bundled generic view classes, extending Media Tree itself and its admin interface, or writing custom plugins for use with your own applications.